Hi y'all! Short time no see. 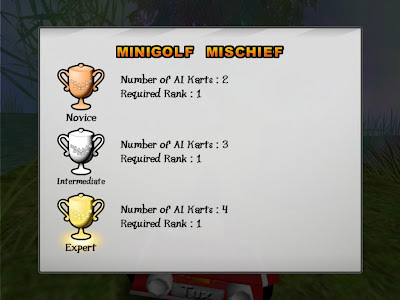 I just thought it would be nice to bring attention to our forums and IRC channel, where a lot of the discussions about SuperTuxKart are going on. The forums now have over 10 000 posts spread across over 700 topics, which goes to show they are fairly active. The developers take an active part in discussions, so if you want to become involved or just come with constructive suggestions the forums are perfect for this. Recently one of our community members started a leaderboard topic where people can post their Time Trial times along with screenshot or video proof. So if you want to have some competition, that would be a nice way to do it while we wait for networking support to come within a few SuperTuxKart releases. Okay, you may think, there are developers on that forum whom I don't identify with due to not being a programmer myself, and there are the other users who probably just fool around with leaderboards (they can do so much more than that! True story). What if I don't care for highscores, and I can't program or do 3D modeling and thus contribute to the game and by extension the community? Whatever should I join the forum for? I'm glad you asked. There are actually quite a few things most people could give a shot and contribute to STK in a meaningful way. The new story mode will feature voice acting for its cutscenes, and possibly all standard karts in races may get some cheers and boo samples, depending on the amount of contributions. Now beware: voice acting is not as easy as some may believe, and is primarily about acting, so keep in mind that we want the end result to be good. Bad voice acting could potentially make the game seem less polished, and we don't want that and as such we can't accept everything. But this could be an interesting way for people to contribute, especially for actors, comedians, singers, or anybody with some degree of live performance experience. You don't have to have such experience or come with any sort of resume though; just try recording some lines/noises with the best available microphone you have at your disposal and upload it to the forum. Maybe this sounds intimidating, but just give it a try! Remember: even though you might not be the next Mel Blanc or June Foray, your contributions could very well be good enough for this game. Maybe the above isn't your thing, but you still want to help out. The story mode will also feature an overworld where you can complete challenges in the difficulty of your choice. Perhaps one challenge is too hard for you, and you really don't want to spend too much time on it. Then you can just choose to drive that particular challenge with medium or easy difficulty, and otherwise settle for driving in 'Hard'. Previously, there was just one difficulty for the challenges. Either you made it, or you didn't. Now, with the new system, there is a high demand for people to playtest and tweak challenges on each difficulty level so we get reasonable results, allowing both new and experienced players to have fun with unlocking features. If you would be interested in this, please register on our forum and engage in discussions and upload suggestions for challenge requirements. This would be a huge help and possibly make version 0.8 both more polished and released more quickly. I usually hang all my hopes on the bouncing ball. What about in easy modes the ball will hit like a heat-seeking-misile on AIs but blunder around blindly if a controller controlled kart is going for first. In the middle mode it will hit both equally but not that easily. In the highest mode the bouncing ball will aim like it's life depended on it, AI or not. When looking through the code my brother and I found out where add-ons are stored. Since we had always wondered where they were we looked at the directory. We found evidence that when ever you allow STK to connect to the Internet it will download stuff. I have two suggestions: Add a warning that it will do what I previously mentioned, and add a dial showing how many bytes of stuff has been downloaded. Not everyone has "Unlimited" Internet access without troublesome small print. I still think a dial is a good idea. For the longest time I didn't keep track of how much stuff I'd downloaded (all the tracks and arenas can make you greedy). I usually connect to the Internet for 4 minutes every few months. Does this dialog box appear in 0.7.3 or in 0.8. I've so far never experienced it. Sorry about this but here goes. Supertuxkart as an open source game can take suggestions, ad-ons and other contributors (Arthur's post up there said the same). However you can't take everyones suggestions to weapons, modes and stuff like that especially if they won't code it themselves. So ad-ons are of course the answer. What about ad-on weapons. It sounds possible at first and then gets more and more complicated. But what if... let me give you an idea for it. There are some. I know this will give you extra work (if you do it) and I'm sorry I can't do it myself but I'm mostly a graphical specialist. Same with my brother. How long do you expect to carry on the STK project. I'm sorry that I have to bring it up but as people move to different gaming platforms STK will become... old for the people who always want what's IN. I'm not really a smart-phone person (the most technology I've ever got my hands on would be a Pentium 3 computer. An idea I've had for a long time... what about putting confetti and firework empties in Blender tracks. When the game is done these erupt. It would look great (but then it would give you a lot of work again). That there isn't more releases lined up doesn't mean STK will not see 1.1, 1.2, and so on and so forth. It just means that we aren't planning too far ahead when we don't know what state the game will be in by then. E.g. there is no 0.9.1 release planned yet, but chances are high there will be several minor releases between 0.9 and 1.0. Also, we're looking a bit into what it would take to get STK to work on Android devices, so hopefully we can keep the game relevant even for people who've mostly abandoned traditional desktop computers. Could do with Playstation and Xbox versions... but that will take you a long time. Speeking of the project... it is my favorite game. Others are here: www.sintelgame.com and www.yofrankie.org. When will Eviltux be put on addons? I can take a whack at that.... are the files in media repo? AC3D (the file format used for 0.6.3) can be opened with Blender (2.49b I think). I'm glad to here someone is reviving Eviltux. I applaud the penguin that suffered the dishonor of having his kart stripped of him and being thrown out beak first. Arthur, your words come back to haunt us. In the original Tux Kart was that Eviltux you were up against? I always thought it was Tux's girl friend. I'm not sure what you mean by ages, but the answer will probably be no. I am not quite sure if Eviltux were in the original TuxKart or if he was introduced when SuperTuxKart came around, but there has always been Tux's girlfriend Penny. She may have gone through at least one dramatic overhaul on the looks, and she is no longer a part of the main game, but that's the way it is. Eviltux, if I'm going out on a limb, was an attempt to create a(nother) nemesis to Tux, similar to how Wario is just an evil version of Mario. It must just have been the age of the .blend. I have Tux Kart on a separate computer. It looks purple and has some Evil Tux elements but I'm not sure. About the nemesis. You probably noticed that in 0.6.3 his plate says TUX but he has scribbled Evil in purple just before it. Just wondering... what country is Arthur_D in. I always wandered about the STK team and am delighted to know that part of the code is Canadian. My brother and I both live in Burnaby BC and, amazingly, are 11. "I always WONDERED about the STK team and am delighted to know that part of the code is Canadian." ...We do have a website... It should be finished by Sunday. But only look if you're interested. We ARE footing the download bill.